Planning ahead and preparing is a key Leave No Trace principle. Having well laid plans in outdoor endeavors can make the difference between being comfortable or being uncomfortable; in more extreme adventures, planning ahead and preparing can be the difference between having a safe trip or ending up in a dangerous situation. But planning ahead doesn’t only affect your own experience, it can affect the surrounding environment and other people as well. It’s important to plan ahead and prepare at all levels of a trip on the PCT—from planning the overall trip and itinerary to daily planning as you move along the trail. 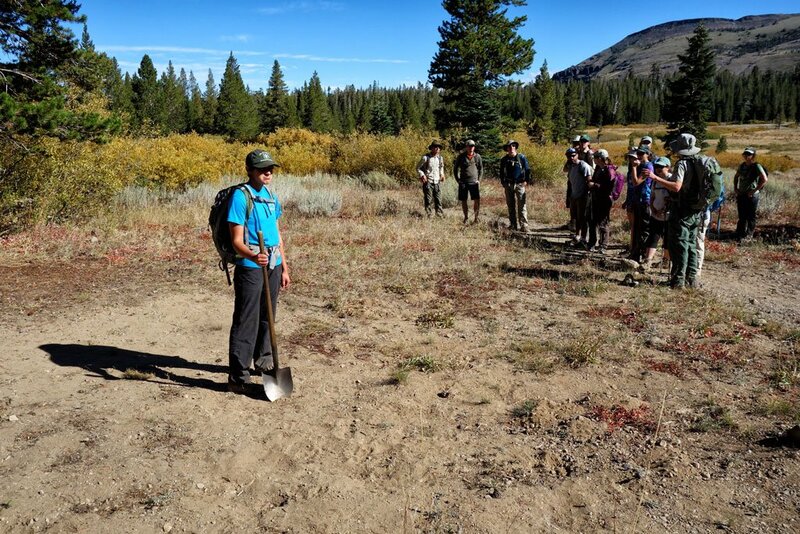 From the human impacts we have seen on the landscapes along the PCT – especially where we have seen people camping – it seems that many PCT hikers could stand to leave more time for daily planning. A very real impact along the PCT of people not having better daily plans is that more hikers choose campsites and tent pads that do not follow another LNT principle: Travel and Camp on Durable Surfaces. Campsites, even if only for one night, should be at least 200 feet away from the PCT and water sources. A pretty good, dry, campsite. It is not uncommon for hikers wander in to a potential campsite in the dark guided only by their headlamps. Between being fatigued from miles of hiking and limited ability in the dark to find an appropriate campsite, many plop down right next to the trail or water source and inadvertently begin creating a new campsite in a poor location. Then, the next hiker follows a similar pattern—hikes all day, finds a water source, is too tired or unmotivated to find an appropriate campsite in the dark, sees a used tent pad location, feels reinforced to use this site because clearly someone else did, and decides to set up camp. Soon the vegetation and duff in this campsite are gone, the soil is compacted, more people use it and the site – and damage – spreads. In desert and high mountain ecosystems, it can take decades for areas to recover once the vegetation is killed and the soil compacted. Depending on the location, this site may be negatively affecting a fragile ecosystem, discouraging wildlife from using a water source, and is an eyesore for every person who hikes or rides by on a horse. If you are like us, you don’t want to see clear evidence of past campers right along, or sometimes virtually on top of, the PCT. Discussing a bad PCT campsite. It’s a new tent pad, feet from the trail. After only a few nights of use, it becomes fairly permanent. The vegetation and soil recovers very slowly, if at all. There were tons of other places to camp in this area that were 200 feet from the trail. So, when you are looking at your map, or app, the night before or the morning you start hiking, plan ahead and leave some time to choose an appropriate camp that follows LNT principles. Sure, we have had days, like many of us, when we’ve stumbled in to camp in the dark and bed down in the first flat spot we could find near water. 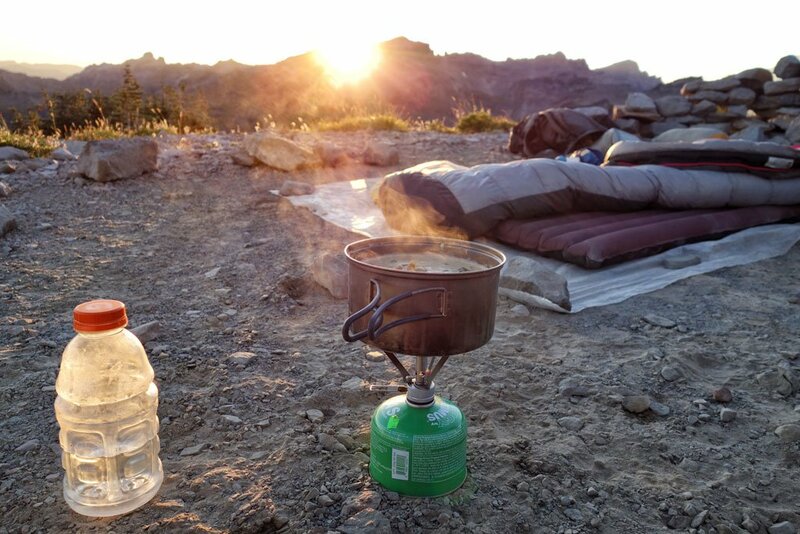 However, that isn’t the way we typically camp when we’re hiking the PCT or traveling in the backcountry. Below are the main reasons we like to leave a little time when we get in to camp at the end of a long day. Most importantly, you can find a location that protects the environment by following LNT practices of camping at least 200 feet from the trail or water. This also reduces your impact on other users. You have time to find that really cool, secluded campsite that is hidden, and maybe even has a great view. Lastly, by getting in to camp before dark, you have time to enjoy your surroundings and be in one location for a while. This leaves time for writing, fishing, exploring the area, etc. If you are getting ready for an adventure on the PCT this year, and whether your trek is for a weekend, or an attempt to hike the entire trail, please leave time each day to plan, prepare and select an appropriate campsite each day. Not only will you reduce your impacts on the surrounding lands and other PCT users, but you may just enjoy the stillness of being in one spot for a while.